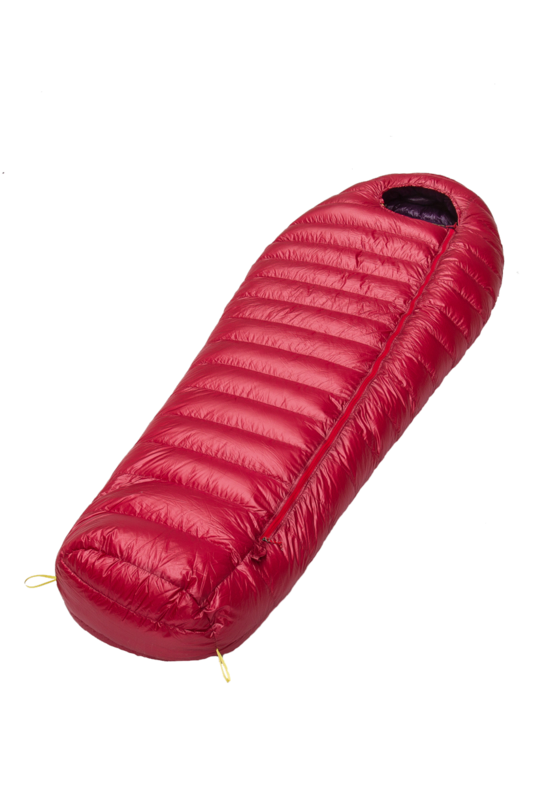 The Firelight 650 is a high quality, lightweight down sleeping bag that is ideal for use in temperatures down to -12°C. Please refer to the detailed information on temperature ratings below and click here for help on choosing a bag. Manufactured wholly in Poland, the Firelight 650 is filled with the famed Polish white Goose down that is 100% ethically recovered (read more here). The down has a fill-power of 900 cubic inches as measured by the EU norm (and is equivalent to 970 cubic inches using the US standard). The Firelight 650 has a full length zip that lies on the top of the bag. The zip is protected by a double baffle. There is a full neck collar that can be adjusted to close completely around the neck to provide a complete seal. The Firelight 650 comes in three sizes and is supplied with a compact stuff sack and a large storage bag. The most important part of a sleeping bag specification as the combination of fill weight and fill power (FP) is what provides the sleeping bag's ability to insulate. 550 g of 900 FP down will fill the same volume as 725 g of 800 FP down or 825 g of 700 FP down. The construction describes how the down is held in place (otherwise all the down would fall to the bottom) and what features are incorporated to maximise heat retention or, conversely, regulate your temperature. The Firelight 650 has sufficient down fill to warrant more sophisticated features such as a full-length side baffle, double zip baffles and an insulated neck baffle. Lightweight fabrics allow the down to loft and reduce the weight of the bag. Although there are lighter-weight versions of the Pertex Quantum fabric we are using, they offer a negligible saving in overall weight and, having a lower tear strength, are easier to damage. The Firelight 650 is an excellent all-round bag for those who are trekking in the Himalayas or other mountain ranges over 6000 metres. It is warm enough for alpine climbing up to 4000 metres most of theyear round. Its versatility is similar to that of the lighter Firelight 750 model, but more for those who want to go as light as possible with the risk of having a couple of cold nights. Please click here for our end-use chart. In 2005 the European Standard EN 13537 became the official standard for the labelling of sleeping bags in the European Community. The standard is not mandatory. Temperature at which a standard adult female can have a comfortable night’s sleep. The lowest temperature at which a standard adult male is deemed able to have a comfortable night’s sleep. More about the temperature ratings can be read here. The Firelight 550 is available in three sizes. All come with a left zip only. The total weight does not include the stuff sack or storage bag.